How to Survive a Cake DISASTER! A DIY Fix! 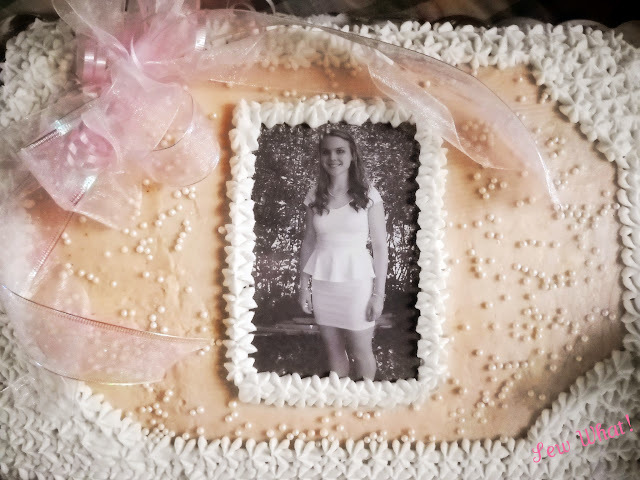 Over a week ago I called a local bakery to have a special cake made for my daughter's graduation. They were completely booked due to many graduation cake requests. Since my oldest daughter lives in the Boston area I decided to find a bakery near her. Knowing she would be coming up the day before the party to attend the evening graduation, well, I just thought how convenient that she could pick it up! No problem, right? WRONG! No way was that going on my dessert table! Now that is some bad penmanship! Not to mention--not in my color scheme! WHAT TO DO??? I went to graduation that night heartsick as I had over 70 people coming to a party at 2:00 the next day and I already had to decorate the camp that we rented, make potato salad, additional sandwiches etc. and lug all the party "stuff" to the camp. I worried and fretted all during graduation! To top it off, people stood up in front of us the entire time so I never saw my daughter at all during the ceremony! I will have to wait for the video! While we were at graduation, we had placed the cake in our freezer chest and it froze enough that my daughter was able to scrape off all the previously melted chocolate lettering and those other chocolate things in the corner that resembled graduation caps...???? THE FIX!!! I went to bed late doing some other food prep and got up early to make a batch of white frosting thinking I was going to have to refrost the entire cake, but then I realized I could use all the frosting that had been star-tipped on and melted and I used it to refrost all sides and part of the top. There were two big cracks so I printed off a photo I had taken of my daughter just before graduation and I slipped it into a plastic magnet enclosure and covered the back with wax paper. Then I framed the photo with star tipping. Then I star-tipped a border around the entire cake (top and bottom) and in all 4 corners where some chocolate had melted into the frosting. We added a bow (the graduates idea and my mom happened to have some pink ribbons) and the little white edible pearls which were perfect as the grad had pearls on around her neck and it all tied in nicely!!!!! The ribbon actually hides a crack that went all the way through the cake. The photo covered up another crack. Not perfect, but it is a cake I can live with! At least more presentable! PS The bakery did not charge us for the cake. (lol now but not lol then....)Though it will not go down in history for being the prettiest cake, it was absolutely most delicious. (Vanilla cake with raspberry buttercream frosting with my white frosting) It made for a great story at the party. I brought a "BEFORE" photo to show everyone! "A Scout is never taken by surprise; he knows exactly what to do whenever anything unexpected happens."